Welcome to this edition of the Safety Compass. We have received a great response to earlier issues and have compiled another issue packed with useful information on tools and success stories to help the safety community build effective highway safety programs. I continue to encourage all of you to submit information on your success stories and experiences, to help all of us improve our safety programs and reduce crashes and fatalities. More than half of all highway fatalities in the United States occur on rural roads, many of which are controlled by local agencies rather than State departments of transportation. This creates a signifi cant challenge in developing and sharing information on "what works" with tens of thousands of local agencies. Our feature story in this issue is one of those success stories. As you will read, Douglas County, Georgia, has adopted a comprehensive approach (i.e., 3 Es: engineering, education and enforcement) to identifying and addressing its highway safety problems, an approach that can be replicated in other areas. This issue is being released just before the annual "Put the Brakes on Fatalities Day" on October 10. We've included a short summary of the activities surrounding this event in this issue of the Safety Compass, but please visit the website for much more information on what is happening and how you can contribute. As always, please share the Safety Compass with others in your organization and let us know if you have any suggestions for improving its content and format. Likewise, if you have thoughts about actions the FHWA Offi ce of Safety can take to support your efforts to improve highway safety, please share those as well. 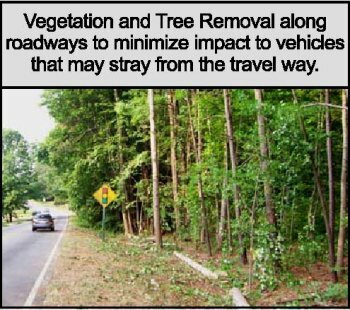 by minimizing impacts to vehicles that leave the roadway with vegetation and tree removal, improving shoulders of the roadway, and guardrail installations. Douglas County, Georgia is a rapidly growing suburban area in the Atlanta metropolitan area. Like many regions experiencing expansive population surges, the county faces the challenge of handling increased traffi c congestion on an out-of-date highway system consisting primarily of 2-lane rural roads. Approximately four years ago, Douglas County made changes to their traditional public works department and created a transportation department. Instead of just maintaining the existing public works infrastructure, county offi cials are now focused on transportation and the challenges that result from rapid growth. Created a "County Safety Action Plan" as a take off from the Georgia Department of Transportation's Safety Action Plan (SAP) Program. They refer to this plan whenever they are given opportunities to obtain funding. The Douglas County DOT effectively uses this action plan to identify areas of concern and to set priorities for utilizing available funds for safety improvements. 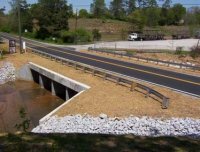 This plan has been particularly helpful to the county as it pursued funding opportunities through the Georgia DOT program to fund off-system safety projects and as the county considers a possible special purpose tax. Begun identifying high crash locations and addressing those locations with low cost safety improvements. Worked closely with other local, state and federal agencies. Made effective utilization of highway data. In developing safety strategies under their action plan, Douglas County offi cials greatly credit the training they received from the Federal Highway Administration. In recent years, Douglas County has taken advantage of several training workshops conducted in Georgia by FHWA, including the Low Cost Safety Improvements workshop, Intersection Safety workshop, and Road Safety Audits. Douglas County credits these workshops with providing the information needed to advance safety by better identifying high crash locations (sites with opportunity) and improving safety at those locations with low cost items such as enhanced signing and pavement markings, improved shoulders, roadside vegetation and tree removal, rumble strips, guard rail installations, illuminated street name signs, and LED signal displays for better visibility. Horizontal curves are a major concern in Douglas County. Many county roads are former wagon trails that were paved over the years without any improvements made to the alignment. Consequently, the county has many run-off-road (ROR) crashes. 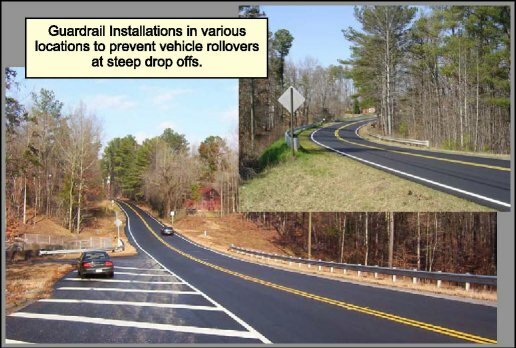 However, there has been a signifi cant reduction in ROR crashes since the county began implementing low cost strategies such as increased use of chevron signs as part of their "Curve Safety Plan." Douglas County utilizes crash reduction factors (CRFs) for specifi c treatments to help determine the potential benefi ts of countermeasures and to establish priorities for implementation. Much of the CRF information was taken from the FHWA workshops. Mr. Keary Lord, Assistant Director for the Douglas County Department of Transportation said that having CRFs has made it easier for him to get funding resources for safety by enabling him to effectively communicate to county offi cials the benefi ts of the treatments. Douglas County has accomplished a successful approach to its transportation challenges resulting from rapid growth. The county is on track to continue to improve not only its own local and state roadways, but is also adding to the safety of our nation's highways - - as are many other local, state and federal agencies who are doing their share to decrease fatalities. Mr. Keary Lord, Assistant Director for the Douglas County Dept. of Transportation Phone: (678) 715-5372 Email: klord@co.douglas.ga.us or Dana Robbins, FHWA Phone: 404-562-3642 Email: Dana.robbins@dot.gov. This year marks the ninth anniversary since the National Work Zone Safety Information Clearinghouse opened its doors. 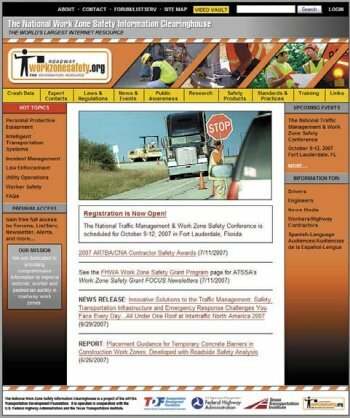 The Clearinghouse, a project of the American Road and Transportation Builders Association's Transportation Development Foundation (ARTBA-TDF) and operated through contract to the Texas Transportation Institute (TTI), is the world's largest online resource for road construction work zone safety information. The Clearinghouse contains information on work zone safety experts nationwide, traffic crash and worker accident data, work zone traffic laws and regulations, agency standards and best practices related to work zone safety, training resources and publications, work zone safety equipment and technology, and past and present work zone safety research. The Clearinghouse was initially established through a grant from the Federal Highway Administration to ARTBA. Over the years, the American Association of State Highway Offficials (AASHTO), ARTBA-TDF, FHWA, Laborers Health and Safety Fund of North America (LHSFA) and other agencies and associations have contributed funds to support the Clearinghouse. Today, the Clearinghouse continues to serve a vital role helping both the public and private sectors improve work zone safety. Since the inception of the Clearinghouse, nearly a half-million users have accessed its resources to find answers to all types of work zone safety-related questions. Users come from all 50 states and from dozens of countries worldwide. A total of 15,000 information entries are included in the various Clearinghouse databases. As part of SAFETEA-LU, Congress authorized federal funding over the next several years to bolster ongoing operations and enhance the functionality of the Clearinghouse. Developing new web-based training materials to host on the Clearinghouse website. To further emphasize the new look and feel of the Clearinghouse, a redesigned logo has been developed along with a new marketing campaign. In addition, a more intuitive website address (www.workzonesafety.org) has been established to make it easier for users to find the Clearinghouse. The National Work Zone SafetyInformation Clearinghouse is sponsoring a major national event in Fort Lauderdale, FL, October 9-12, 2007: The National Traffic Management and Work Zone Safety Conference. The conference, being held in conjunction with Intertraffic North America and the 2007 ARTBA National Convention, will bring together transportation professionals from all levels of government and private industry to discuss challenges and cutting edge solutions to help improve the safe and efficient movement of traffic under many different roadway conditions. Planned topics include: nighttime road construction, law and speed enforcement in work zones, traffic and congestion management, emergency evacuation and disaster response, work zone safety training programs, work zone impact analyses, automated tolling and pricing, liability, trends in integrating ITS technologies, and bridging the gap between technology development and deployment. Highlights of the conference include tours of the Broward County Traffic Management Center and a live vehicle rollover demonstration. "As a forum for information exchange, the conference will help improve the safe movement of traffic under many different roadway conditions," explains Brad Sant, Vice President of Safety & Education for ARTBA. A preliminary agenda and registration forms are available at www.workzonesafety.org. 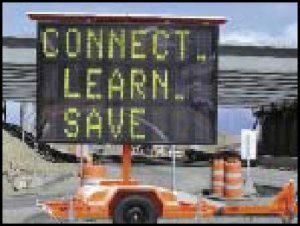 The $175 registration fee for the National Traffic Management and Work Zone Safety Conference also covers admission to Intertraffic North America 2007, and scholarships are available for all U.S. local, state and federal government employees. Partners include: ARTBA-TDF, AASHTO, FHWA, and TTI. Other organizations providing support include: the National Asphalt Pavement Association, LHSFA, International Union of Operating Engineers, National Utility Contractors Association, National Institute for Occupational Safety and Health and CNA Insurance. The Clearinghouse staff looks forward to these new initiatives and to the conference in October. We hope to see you there! For more information about the clearing house or conference, contact Lisa McCluskey at lmccluskey@artba.org or 202.289.4434. The Federal Lands Highway Divisions (FLHD) of the Federal Highway Administration partner with the National Park Service, Forest Service, Fish and Wildlife Service and other federal, state, and local agencies to plan design and build roads into and within federally owned lands. These roads are frequently low volume and/or low speed facilities which frequently raise safety concerns due to mountainous terrain, forests, boulders, and water hazards. These safety concerns are somewhat mitigated, because the roads generally have low nighttime traffic, may be closed during the winter—and many have restrictions on vehicle length, or commercial truck usage. 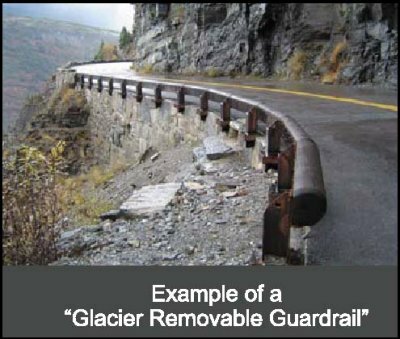 In 2003 the Highway Safety Engineers in FLHD (aka the FLH Safety Team) identified a need for barrier guidance on low volume and low speed roads. Besides addressing the design and cost of barriers, any guidance would also need to take into consideration the environmental, wildlife, and aesthetic concerns of the partner agencies. The FLH Safety Team contracted with PerformTech, Inc., to develop a barrier guide that would expand on the AASHTO Roadside Design Guide (RDG) design process, making it more applicable to low volume (under 400 ADT), low speed (under 40 mph or 60 km/h) rural conditions. I In late 2005 the "Barrier Guide for Low Volume and Low Speed Roads" was completed. This guide recognizes that the full clear zones and barrier warrants recommended in the RDG may be impractical to achieve on rural low volume and low speed roads, and offers guidelines to identify the most serious roadside hazards. In addition to the Barrier Guide, a four-hour training package was developed along with a CDROM that provides an overview of the Barrier Guide and various types of barriers and terminals. 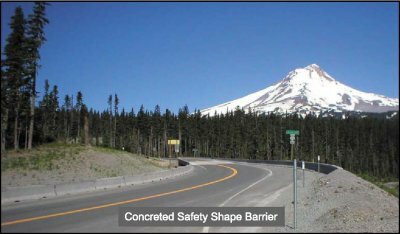 For more information please contact: Tori Brinkly, Highway Safety Engineer, Western Federal Lands Division, FHWA at: 360-619-7885, or email: victoria.brinkly@fhwa.dot.gov. The first annual Put the Brakes on Fatalities Day was held October 10, 2001, sponsored by the Federal Highway Administration along with other partners. Its goal was then, and remains today, to deliver messages in an upbeat fashion to the public about the major causes of transportation fatalities - chiefly highway fatalities - and how to avoid them. To achieve this goal, organizations are encouraged to hold annual highway safety programs, either as individual events or in coordination with state and local events across the country. As appropriate, state and local events are encouraged to support activities included in states' Strategic Highway Safety Plans. A national steering committee provides program direction and information for a web site which includes how to hold an event, material available and who to contact for assistance. The steering committee consists of interested partnering organizations. IIn the fall of 2006 the Transportation & Development Institute (T&DI) of the American Society of Civil Engineers (ASCE) became the manager of the web site for the program. National, state and local organizations, both public and private, that have an interest in the program are encouraged to contact the T&DI at pbfday@asce.org to express their level of interest. Links to ongoing highway safety programs. And many more activities that you can view on the web site below. The goal is to heighten consciousness about what people can do - and what official steps they should take - to reduce transportation fatalities and crashes on American highways, roads and streets by calling attention to reducing fatalities on one specific day and also with other traffi c safety events held during the year. 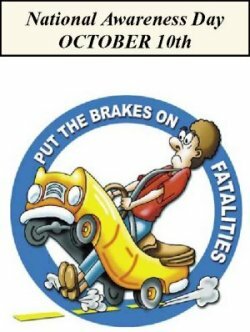 To learn more about Put the Brakes on Fatalities Day, please visit the website at: http://www.brakesonfatalities.org/default.html. This photograph shows newly installed signal heads with 12-inch bulbs alongside the smaller signal head they replaced. 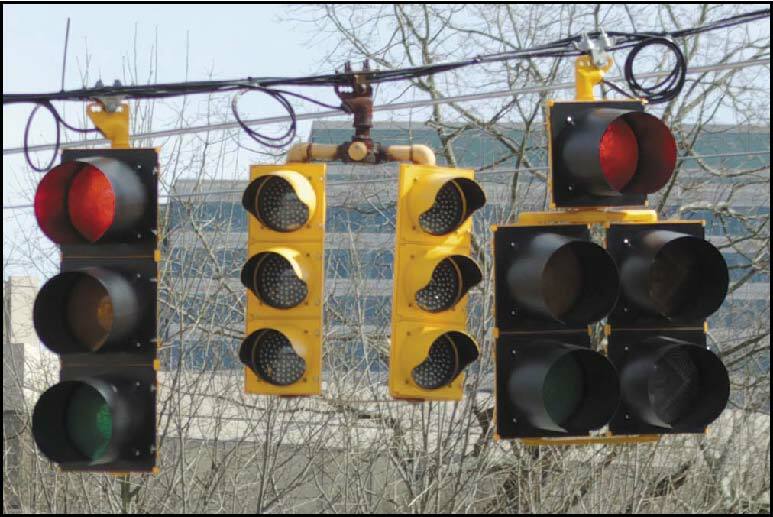 Practitioners can learn more about this upgrade and other safety countermeasures for signalized intersections by attending a session of the FHWA Resource Center-developed "Signalized Intersection Guidebook Workshop," available through the National Highway Institute (NHI). For more information on this and other available safety workshops, please visit: http://www.nhi.fhwa.dot.gov/. There was an exceptional amount of great entries submitted into the 2007 National Roadway Safety Awards competition. The judging process has ended, and the results will be announced soon. The National Roadway Safety Awards program honors agencies and organizations in the transportation community that have made verifiable and significant strides toward improving the safety of our nation's highways through infrastructure improvements, operational improvements or program planning, development and evaluation. Every two years, this prestigious biennial award program examines the "best of the best" using effectiveness, innovation, and efficient use of resources as criteria in determining which projects will receive this coveted award. It is jointly sponsored by the U.S. Department of Transportation's Federal Highway Administration and the Roadway Safety Foundation. The Blue Ribbon Panel of safety leaders met on July 19, 2007 in Washington, DC, to review the nominations received and determine which projects would be awarded or receive honorable mentions in this biennium's Best Practices Guide. The 2007 Roadway Safety Awards Ceremony and luncheon will be held in November at the National Press Club in Washington, DC. The winners will be listed in the next issue of the Safety Compass, and will receive other public acknowledgment through media sources, trade publications and the Best Practices Guide, a printed publication resulting from each competition. The Safety Compass will feature the awarding winning best practices in the next few issues starting in December. 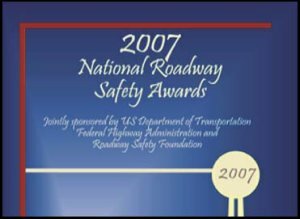 To learn more about this program, please visit online at: http://www.roadwaysafetyawards.org/.